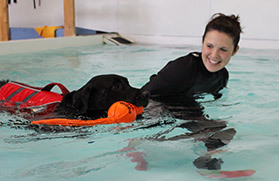 Welcome to York Canine Hydro, based in York, North Yorkshire - we are a specialist Canine Hydrotherapy and Rehabilitation centre, where we believe the health, both mental and physical, of our canine companions, is of the utmost importance. We are passionate about the benefits of a structured, caring and professionally delivered treatment programme and so we work closely with Vets, Orthopaedic Surgeons, Owners and Dogs to deliver a service that is second to none. 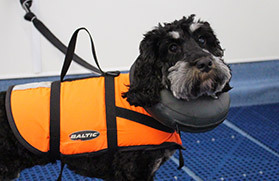 Alongside our skilled and experienced Hydrotherapists, we also work with experienced Physiotherapists - Hannah Michael of Theakston Physiotherapy Services and Jill Hall of Vital Vet Physio, who run clinics from our centre to provide additional assistance should it be required, to ensure the total well being of your treasured companion. In order to ensure a complete and professional service, we require all our dogs to have a Referral Form from their Veterinary Surgeon or Orthopaedic Surgeon, who we then continue to liaise with and report back to throughout the duration of the treatment, thus ensuring a complete medical history is available, before, during and after treatment. 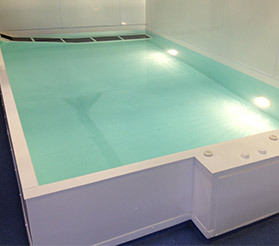 As a member of the above, we are governed by strict guidelines and codes of conduct that ensure Training, Knowledge, Skill and Professionalism are all maintained to the highest standards, ensuring that the treatment and pool management are of the highest standard and delivered by people who have the knowledge and experience in delivering hydrotherapy and rehabilitation programmes. Membership with a governing body such as the above is also usually a prerequisite for the Insurance Companies. Based in Upper Poppleton, York, we are easily accessible from the main road. Our prime location gives fantastic access from other Yorkshire towns such as Leeds, Harrogate, Thirsk, Scarborough, and Hull.